Up for review today is a rather unique pair of earbuds from Painted Tune. The case is what looks like a tube of paint. They retail for $20.00, and claim to have sound quality similar to a $100 pair. We will be putting it to the test. The model sent to us was Sky Blue. Tangle-free flat soft wire cable. Lightweight, comfortable in-ear design with three different size ear cups included. High efficiency headphones with full frequency response of 20Hz to 20,000Hz. Cool paint tube carrying case with snap flap. Includes three conforming ear cup sizes to provide good fit, deep bass and passive noise cancellation. Quality appears very good for a $20 model. They are completely blue except for the gold plated tip. They use a tangle free cable design, that while it was a bit thin, did seem to be of good quality. The connection terminals to the earbud housing also appeared good overall, quality of materials used appeared good, as was the fit and finish. They did look a decent amount more than $20. Maybe in the $40-50 range. FreshAire II: Going to Another Place: had cool crisp strings, and ok air on the flute. The piano sounded natural. Justin Timberlake: Sexyback: had nice base output. Extension was ok, with only a small amount of some distortion. Vocals were natural, and it was fairly dynamic. Junior Wells: Why are People Like That: vocals sounded natural, harmonica had nice harmonics but not quite as dynamic. Did they perform like $20 earbuds? Most definitely not! They did sound much better than that. Did they sound as good as a $100 pair of IEM's? Not as good as the models I have on hand. They were not quite as clean sounding, or as dynamic, or as much resolution. But I was still surprised at the sound for the price. 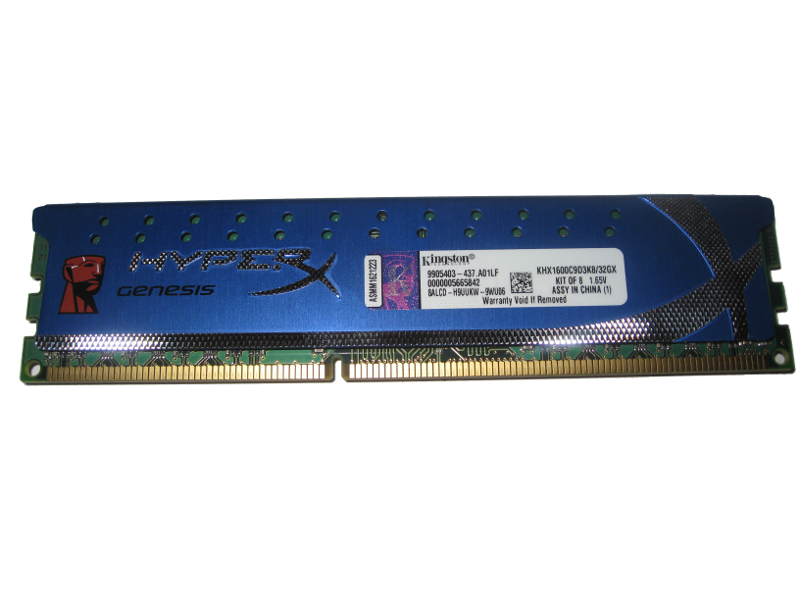 Up for review today we have a 32GB kit of HyperX Genesis Quad Channel DDR3. That’s 32GB of pure DDR3 heaven. Kingston has had a strong presence with computer memory for several years so we’re definitely excited to see how their quad channel genesis line of memory performs. The HyperX line from Kingston is their high end enthusiast line of products. Kingston does an excellent job of making memory that can perform while being undervolted from the specifications of the chips. Anyone interested in the power profile of their machines will want to stay tuned. 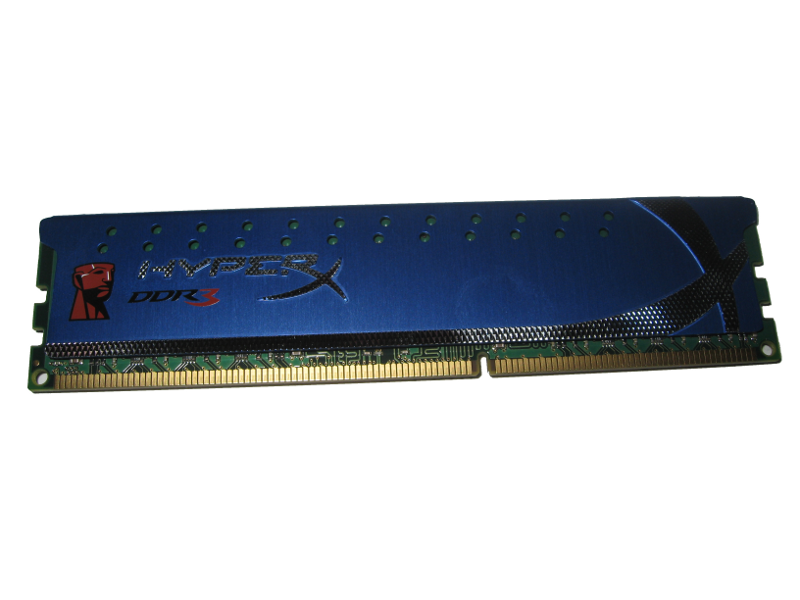 The memory comes with a very attractive blue heatsink which is the standard HyperX color we’re used to. I really like the silver diamond plate look they’ve used for the HyperX banding on the left. some might not care for the colors, but they certainly do it for me. The Genesis line does not have the larger heatsink. If that’s what you’re looking for you might check out their HyperX T1 line or their HyperX H2O line. If you’re CPU cooler is one of the larger coolers then the larger sized heatsinks could be a problem. The Genesis line is perfect for larger CPU coolers because it won’t have anything getting in the way and it won’t prevent you from using that awesome CPU cooler you have your eye on. This kit runs at 1600 MHz and has low latency timings of 9-9-9 at 1.65v. Right out of the box we know that the memory is supposed to run at 1.65v. We’re going to see how far we can undervolt the memory while maintaining a stable platform. We’ll throw everything we can at it to get it to crash till we find that sweet spot of low voltage and high performance. Our first stop was at 1.5v. As we had expected the memory held strong at 1.5v. We decided to bump it down even farther. This time we took it down to 1.4v. We ran a burn in test on the memory and it passed with flying colors. We would like to point out that any time you adjust hardware settings like voltage you should run extensive tests to make sure that your hardware is stable. We did not run any 24 hour long memory tests but anyone making these changes should do so to be sure that their setup is stable. We couldn’t boot at 1.3v so we brought it up to 1.35v and this time it booted and passed all of our burn in tests. Our final stable voltage was 1.35v. That’s an impressive 0.3v under the memory’s spec. The next thing we wanted to do was see how much we could overclock the memory. Overclocking usually means voltages will need to be increased to attain those higher speeds. Our final stable speed was 1866 MHz with timings of 9-10-9-24-2T. We were hoping for higher speeds, but Kingston mentioned that quad channel memory does not overclock as easily as dual channel memory. Windows booted with higher speeds and looser timings, but we ran into several errors, and the system wasn’t very stable so we were forced to bump it back down to 1866 MHz. We also had to bump the voltage up to 1.55v to keep the system stable with the memory running at 1866 MHz and timings of 9-10-9-24-2T. The HyperX line of Kingston products is always one that you can count on. These modules are no exception. The build quality of the memory is exceptional and does not get in the way of larger enthusiast CPU cooling setups. The design is a pleasure to look at. For those that are interested in the power profile of their system, this memory is extremely flexible in that area. If you’re looking to overclock the memory to higher speeds, you will need looser timings, more power and your end result is largely going to be dependent on your individual setup. 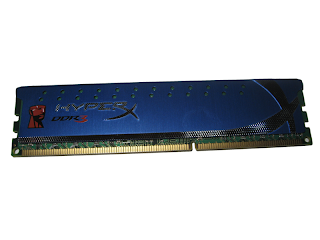 Based on it's design, features, quality, and performance, the Kingston HyperX Genesis DDR3-1600 kit has earned our Highly Recommended Award. For more info and complete specs, check out their websire at www.kingston.com. New 2012 Zed Audio Amps - Coming May 2012! *Turn on circuit automatically senses that if a trigger voltage is applied to the remote port, the signal and DC sensing circuits are locked off. If no trigger voltage is applied to the remote input, then turn in is accomplished by the signal or DC sensing circuit. *Power supply is regulated and uses my dual rail technology for higher efficiency. *When the heat sink temperature reaches 57 deg C the high rail is prevented from switching on. *Full range class D design using all discrete circuits. *RCA inputs x 4 balanced and will accept OEM radio direct. *RCA line outputs, 1 in phase for daisy chaining and 1 anti-phase for bridging 2 amps. *Remote level port. This port includes drive for power and clip LEDs. *Selector switch for FLAT, FULL PREAMPLIFIER or SLAVE. *RCA inputs x 6 balanced and will accept OEM radio direct. * Master input selector switch allows 2, 4 or 6 channel input selection. * Position “6 in” means 6 inputs to 6 outputs. * Position “4 in” means 1-4 inputs to 6 outputs where channel 5 receives the mix of channels 1+3 and channel 6 the mix of 2+4. * Position “2 in” means input 1 feeds Chs 1, 3 and 5 and input 2 feeds Chs 2, 4 and 6. Improving the overall performance of a computer usually boils down to identifying the bottlenecks for a given computer. HDD drives, or hard drives with spinning platters, have moving parts in them. As you might imagine, anything with moving parts is going to be significantly slower than a similar device that does not require moving parts. 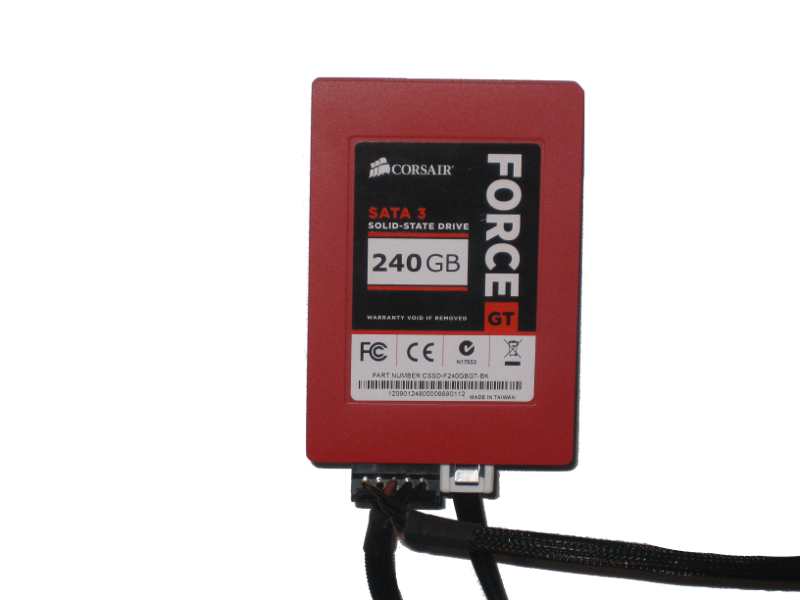 SATA III introduced higher bandwidth capabilities of up to 6 Gb/s. That’s a speed you will not come close to reaching with any standard HDD. In today’s review we will be showcasing three different SATA III SSD’s (Solid State Drives) each of varying sizes and specifications that already push the limit of what SATA III allows. They are the OCZ Vertex 3 60GB, Kingston SSDNOW V+200 120GB, and Corsair Force GT 240GB SSD SATA III drives. Right away we know we’re in for a treat looking at the high IOPS (Input/Output Operations Per Second) and read/write speeds. 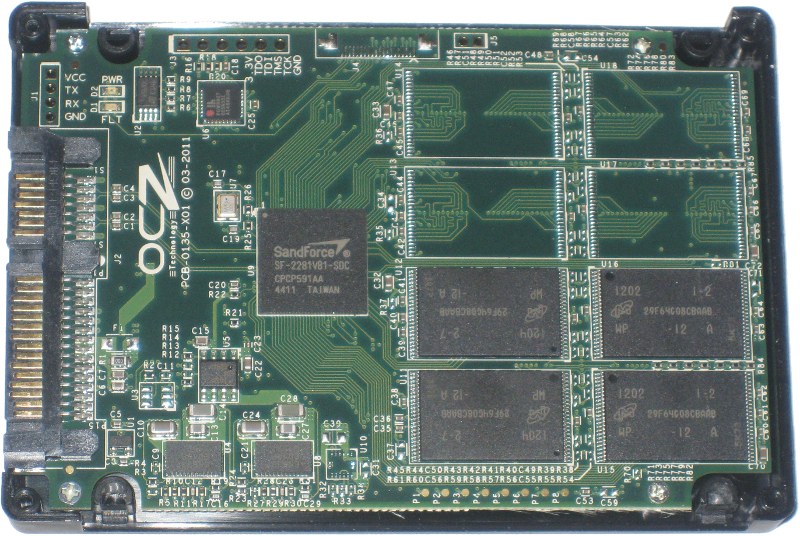 OCZ uses synchronous NAND for their Vertex 3 drives. Synchronous NAND is much faster than the alternative Asynchronous NAND. 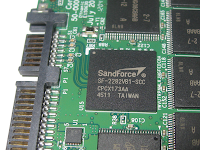 However, Synchronous NAND usually comes at a bit of a cost. 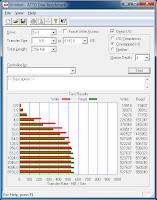 We’re looking at similar read/write speeds to our 60GB OCZ drive. The IOPS are not quite as high which is probably due to this being a business drive rather than an enthusiast drive. Kingston uses Asynchronous NAND for this drive, so keep that in mind as we run through our benchmarks. The sustained random write 4KB IOPS was not available on their website, but judging from the max 4K random write IOPS all we can say is that we’re excited to put this one to the test. This is another drive targeted at the enthusiast market, so it comes as no surprise that Corsair is using Synchronous NAND in their Force Series SSD’s. The first two applications use random data to test the drive’s performance while ATTO uses raw data which does a good job of demonstrating the full potential of the drives. ATTO has been around for years and it is what most manufacturers use for their specifications. We turn to AS SSD and CrystalDiskMark because they use random data which will come closer to simulating real world performance. As always, benchmarks are not a definitive guide to how well a device works but they should give you a good idea of what you can expect. 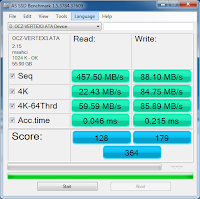 The 60GB Vertex 3 drive from OCZ starts out setting the bar pretty high. Read speeds are averaging 457.5 MB/s in sequential reads which is due to its synchronous NAND. Another impressive number worth pointing out here is the read access time. A stunning 0.046 ms is faster than the other two drives we reviewed today. From ATTO we can see that the fastest read was 560538 KB/s while the fastest write was 502,923 KB/s. These results are higher than the 535 MB/s and 480 MB/s listed on their website. 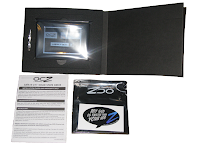 The results we’re seeing from OCZ’s enthusiast line Vertex 3 are nothing short of jaw dropping. If you’re looking for a fast SSD priced at just under $100 we highly recommend the Vertex 3 60GB SSD from OCZ. You will not be disappointed with the results. ●DuraWrite - optimized writes to extend endurance, security and reliability usually come at a cost and we do see that in these first two benchmarks. I have to say, this is a bit unexpected. 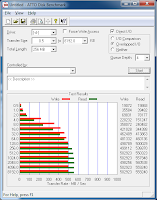 Much like the OCZ drive, Kingston outperforms the advertised speeds for the V+200. Our fastest results were 554109 KB/s read and 517465KB/s write. This is a drive that offers reliability a business can depend on and still delivers some impressive speeds. Any business owner considering switching to SSD’s should not overlook the reliability and speed you get from the Kingston SSDNOW V+200. Are you seeing what I’m seeing? Somebody pinch me now because this must be a dream! This drive is absolutely amazing. 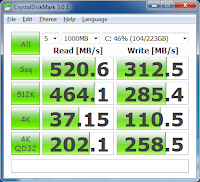 Obviously geared towards the enthusiasts, the Corsair Force GT 240GB drive really shines in these benchmarks. The read access time is is not as fast on the reads as the other two drives, but it pulls ahead in the write access time. This drive outperforms the other two in just about every scenario we see in these reviews. The fastest read was 560538 KB/s and the fastest write was 527637 KB/s which out performs the drive’s specs if only by a margin. We pointed out earlier that the Kingston drive uses a SF-2281 controller. Let’s have a look at the other two drives. Pulling apart the OCZ drive we can clearly see it is using the same SandForce SF-2281 controller. This could possibly explain why it suffers from the random data write benchmarks, but the Synchronous NAND helps it stay ahead in performance. Opening up the Corsair drive we can see that it too uses SandForce, but this controller is the SF-2282. The SF-2282 controller is similar to the SF-2281, with the difference being in the capacities it supports. As most things go, price is almost always going to be a part of the decision making process. With that in mind, the OCZ Vertex 3 60GB SSD can be picked up for roughly $98.99, Kingston’s SSDNow V+200 120GB SSD will cost you about $149.99, and the Corsair Force GT 240GB SSD is going for about $299.99. If you’re looking for one of the fastest drives out there without breaking the piggy bank then you might want to look at the Vertex 3 60GB fromOCZ. 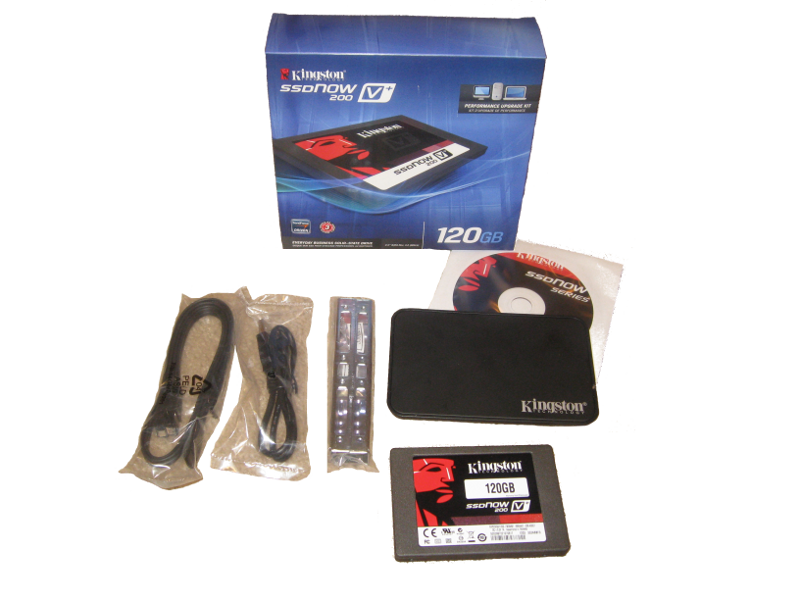 If reliability is your main concern but you still need speed then the V+200 SSD from Kingston is a safe bet. You also get the hard drive enclosure as an added bonus. 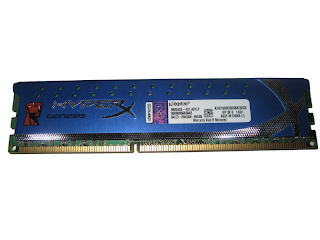 We’re expecting a HyperX drive from Kingston that uses Synchronous NAND where we’ll give them the opportunity to demonstrate the performance you can expect from their enthusiast line. Lastly, the Corsair is breathtakingly fast! If you have the money for their 240GB Force GT SSD then you’ll have a very capable drive that delivers in every way you would expect from an enthusiast SSD. 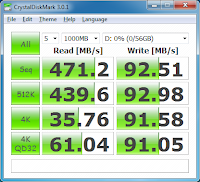 All three drives performed excellently, and are built well. Quality was very good. 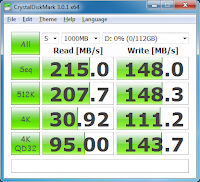 The OCZ Vertex 3, Kingston SSDNOW V+200, and Corsair Force GT series of SSD drives are all very fast. Based on their design, features, quality, and performance, the OCZ Vertex 3 60GB and the Kingston SSDNOW V+200 have both earned our Highly Recommended Award. 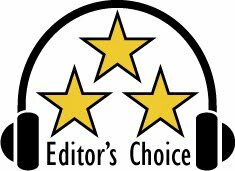 And the Corsair Force GT 240GB has earned our Editor's Choice Award. Congrats! For more info and complete specs, check out their websites at www.ocz.com, www.kingston.com, and www.corsair.com. I remember growing up in high school with my first car stereo system. Everyone liked a lot of bass. Big amps, big subwoofers, and the brands of choice were usually Rockford Fosgate, Kicker, or Orion, to name a few. They gave a lot of bang for the buck. But it was widely known that if you want the best, its gotta be MB Quart. The German Manufacturer MB Quart, was the best. But in 2007/2008 they were bought and the plant was shut down. So employees found themselves without a job. But not to be kept down, German Maestro was formed, and is run and operated out of the same located by a majority of the same management and employees. So the old MB Quart magic is alive in the new German Maestro brand name. The factory, the hundreds of years of combined experience, and the R&D. It was all there. So it was mostly just a change in brand names. They even service and repair the old MB Quart products for customers. I was previously given the opportunity to review a pair of their headphones in our 2011 Headphone Shootout. 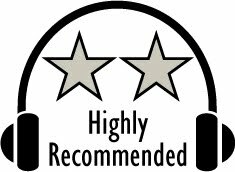 And when given the opportunity to review a pair of their car stereo component systems, I naturally jumped at it! I was pleasantly surprised when a pair of their top of the line M-Line series 2-way component systems, the MS 6508, showed up on my doorstop. I was familiar with the old school MB Quarts. And knowing the story behind the new company, I was ecstatic to confirm that things really haven't changed. And like the top quality MB Quart, these are also hand made in their German plant. -Power Handling: 90 W RMS / 290 W Max. The packaging was top notch. Opening the box revealed a set of tweeters, midrange and crossovers sitting on red velvet. Also included was the owners manual, install instructions and hardware. Inspecting the drivers and crossovers revealed top quality components made from top quality materials. Build quality and fit and finish was also excellent. Pulling the plastic wrapper off of the tweeter revealed a solid driver. The tweeter was shipped with a plastic cap for further protection. Removing it showed the coated titanium inverted tweeter. It was fairly large for a tweeter, and had a powerful neodymium magnet. Looking at the large 16 gauge wiring at the back of the tweeter was a hint to the quality and power handling capability. Tweeters often come with 20 gauge or higher wiring. So the large gauge wiring on a tweeter is quite a statement. The back also showed the 6 ohm rating, and made in Germany stamp. Mounting options are flush or surface mount. Protection to the tweeter's inverted dome is provided by either two thin bars that go across the surface, or a black mesh grill. The 6.5 inch midrange is also a very solidly built component. Just like the tweeters are shipped in the box with a plastic cover over the top of the tweeter for protection, the midrange is shipped screwed into the surface ring and covered with the grill for protection. The German Maestro builders take pride in a top of the line product. And the small details like the cap over the tweeter show the pride in craftsmanship that German Maestro has in their products. I took off the grill and unscrewed the driver from the surface ring, so I could get a better look at the midrange driver itself. Starting at the rear, we find the solidly built and relatively thick cast aluminum basket. Printed on the back was informative info on the driver, showing 4 ohm resistance, and 90 watts power handling. The motor system is powered by a small yet powerful neodymium magnet. It was obvious by the small size of the magnet hidden behind the basket. I like the fact that German Maestro went with Neodymium for the magnet. It is easy for consumers to have the perception of more is better. So a big magnet must be better than a small one. This is not reality though. Neodymium has the same abilities, but in a much smaller size. And in a car stereo speaker this also translates into more installation options with a shallower depth. It opens up the number of car manufacturers and models that would accommodate the driver. I also liked the design of the driver. The cast basket was painted gloss black, and gave an elegant look. And I really liked the terminals for the speaker wire. They were gold plated for a good connection, and also allowed for two connection options: bare wire and terminal connector. The tinsel lead was well secured at both ends, with a quality solder at the terminal, and glued to the back of the speaker cone. The spider also appeared of high quality and was well attached to the basket. You could see from the back side that they used a black polypropylene cone, and as shown from the front was the nano-ceramic coating. The front of the cone was well coated, and had a quality rubber surround. A generous amount of adhesive was used to attach it to the basket. It appears to not only be built for some decent excursion, but can handle doing so for years. The crossover network was of the same build quality as the tweeter and midrange. There were 4 levels of tweeter and 3 levels of midrange attenuation. It has an elegant look, and the level of detail was also applied to installation options. You can mount the crossover both vertically and horizontally. Installation was also not left out of the equation. Included was a well written manual with pictures and diagrams. They even provided large cutout stickers. This would be applied to the mounting surface and you just cut down the line with your preferred power tool. And to show you are a fan, you can attach the included German Maestro stickers to your vehicle. The German Maestro MS 6508 2-way component set loves to play music. It was an aural seduction from the moment I turned my reference system on! I went through all of my reference material, and every music type that I listened to was a tasty treat to my ears. Fresh Air II: Going To Another Place was just so clean sounding. The percussion was crisp and the flute had a lot of air. And the resolution was amazing! I could actually hear the tonguing of the flute. A Fresh Aire Christmas: God Rest Ye Merry Gentlemen had the same clean sound. Percussions were crisp and the horns were smooth. There is also a lot of use of drums, with them going back and forth from left to right channels. Pitch definition was excellent, and the drums were tight with great authority. Brunson Brothers: Fleace Movae, showed off trumpets the way they were meant to be heard. I am personal long time friends with them, so I have been listening to this for a very long time. Yet still, I amazingly heard details I had not previously heard. What appeared to be 32nd notes, played by Strunz & Farah, were so fast yet each individual note could be heard! The German Maestro MS 6508 component system is that good. Vocals were also excellent. Boys To Men II: Yesterday was so silky smooth, it was like Dove chocolate for my ears. Top 40 and rock also sounded superb with every instrument and vocals that tried to challenge them. And the harmonics were overall excellent with no noticeable coloration. The sound will provide for anyones listening tastes. If you prefer your sound a bit bright, they will deliver. The sound initially was a bit bright for me, with the crossovers tweeter attenuation setting on A. Turning them to setting C toned them down a bit without losing any of their detail. I was impressed with their midbass performance as well. The MS 6508 sounded amazing as a 2-way component system. And the midbass driver has the goods to be a stellar dedicated midbass driver, as it is in the MS 654010 3-way component system. Any cons? Well, it is a 2-way system, and 3-way component systems tend to be more dynamic. However the MS 6508 was about as dynamic as my Vibe Space 3D 3-way component system. I know that is a stretch for a con, but what can I say? They really are that good, and EXTREMELY musical. The MS 654010 3-way component system should be an even better treat, and will be in for review soon. So stay tuned for another treat. Well, while the name has changed, I am glad to have heard that what really matters most...the end product, has not changed. At least not for the worst. The guys out at the Obrigheim factory still have the magic. Listening to the German Maestro MS 6508 was pure aural bliss that began as soon as the power was turned on my receiver. With an MSRP at $1,650, this special product is not cheap. But oh is it worth it! For the audiophiles who have a taste for fine sound, it is worth listening to. And the connoisseurs who pick up a pair will forget about every penny paid. They have easily won our Editor's Choice Award. For more info and complete specs, check out their website at www.german-maestro.com. Reference gear used included Kenwood Excelon DNX9980HD Multimedia Receiver, Vibe Audio LiteBox Stereo 4 Class GH amplifier, Vibe Audio Black Death Bass 1 Class GH mono amplifier, Alpine Type-X SPX-13PRO 2-way component speaker system, Kicker Solo-Baric L7 15" Subwoofer.